The K-kit is an easy to use innovative sample holder for liquid specimens. It is a single-use sample holder with a sealable micro-channel between two silicon nitride membranes. The K-kit is made from silicon with Si3N4 membranes, using the latest MEMS technologies. Included with the K-kit is a copper aperture grid to mount the sealed wet cell. The k-kit is compatible with most standard TEM holders. The microchannel, with two rectangular silicon nitride windows, enables imaging and analysis of nano-particles suspended in aqueous solutions. The size of the silicon nitride window is 300µm x 25µm with channel heights of 0.2 and 2µm. The inside of the microchannel is coated with Si3N4. Applications are wide ranging from, material, life, chemical and biological sciences. Nanoparticles can be imaged in their native state or in-situ dynamic physical and/or chemical reactions can be observed. The K-kit can also be used in dry mode. The suspended particles are dried in the K-kit microchannel to avoid agglomeration which tends to occur when droplets of suspensions are dried on a support film. Compatible with FESEM – STEM detectors. The K-kits with the 30nm Si3N4 membranes are compatible with FESEM s equipped with a STEM detector when 25 – 30kV is used for imaging. The best results are achieved in dry mode. The Polyimide (Kapton) tapes are now available with 0.08 and 0.12mm thickness. Available in widths of 5 to 50mm with a tape length of 33m. Clean 76mm diameter plastic core. The low static single sided Polyimide (Kapton) has been designed for use in ESD sensitive applications. Unwinding conventional polyimide tapes can generate static electricity. The selfwound low static polyimide (Kapton) tape comprises similar specifications as the single sided polyimide tape combined with extremely low electrostatic discharge properties. The tape has been threated to greatly reduce electrostatic discharge. Available in widths of 5 to 50mm with a tape length of 33m. Clean 76mm diameter plastic core. 1 - Micro-Tec MTB manual tablet press for Ø3, 6 and 8mm tablets. Manual press with integrated tablet mold, punch and die. 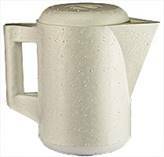 Overall size is 185 x 120 x 210mm with a handle length of 195mm. 2 - Micro-Tec TPD tablet punch die kit for Ø6, 9 and 12mm tablets. A hammer or separate press is needed to form the tablets. Consists of 4 pieces. EM-Tec high purity sputter targets on an aluminium disc substrate, compatible with Emitech /EMS K500/550/650 sputter coaters. Available target materials are Au, Au/Pd, Pd, Pt and Ag. The EM-Tec RXS-36MC materials reference standard includes 36 reference metals/ compound standards and a 200µm aperture copper Faraday cup. All mounted in a Ø25.4 x 9 mm AISI 303 stainless steel disc. Intended as reference standard for quantitative EDS and WDS micro-analysis applications. The EM-Tec RXS-40MC+CL minerals reference standard includes 40 reference minerals and a 200µm aperture copper Faraday cup. EDS spectra, cathode luminescence spectra and quantitative EDS analysis results are provided for each mineral. 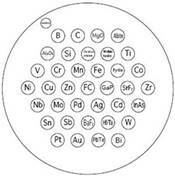 All minerals are mounted in a Ø25.4 pin stub, made from AISI 303 stainless steel. All minerals are embedded in conductive silver filled epoxy. The stoichiometric compositions of these natural minerals are nominal. Intended as reference standard for CL set-up and test, quantitative EDS and WDS micro-analysis applications. 200µm copper Faraday cup and 40 minerals. The EM-Tec single sided conductive copper SEM tapes are now also available in 25 and 50mm width. The high quality Micro-Tec single edge cutting blades are made from a select surgical grade carbon tool steel. The hardened C1095 carbon steel cutting blades are precisely ground for superior sharpness and excellent cutting quality. The single edge cutting blades include a back for safe handling. The cutting blades are individually wrapped for protection, except the ones in the clear dispenser box. 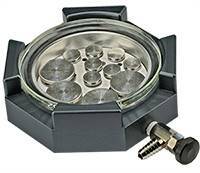 Micro-Tec borosilicate glass petri dishes for sample preparation and microscopy applications. Made from chemically resistant, low expansion, heat resistant and highly transparent borosilicate glass. Ideal for sample preparation, mixing of small volumes, melting of wax, sorting and sifting. Micro-Tec borosilicate glass is also known under the brand names Pyrex and Duran. 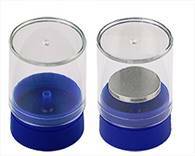 The Micro-Tec borosilicate petri dishes are available in three sizes: 60, 75 and 90mm diameter complete with lid. The selection of the ø54 and ø57mm diameter sputter targets has been expanded with Cobalt, Indium, Tin and Zinc sputter targets. The ø82 x ø60mm precious metal annular targets are now available with 0.2mm target thickness for increased target life and reduced overall costs. finish for the graphite plate is less fine as for the graphite planchets; the plates are cut from thicker plates to reduce thickness and weight. Made from high purity graphite material, they are available in sizes 50 x 50 x 1mm, 70 x 80 x 1.2mm, 100 x 50 x 2mm and 100 x 100 x2mm. 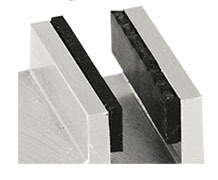 For increased mechanical stability, the graphite plates can be mounted metal substrates. The graphite plates are sold in pkg/5. The professional PIKAL metal polish paste is now supplemented by PIKAL CARE metal polish and PIKAL Liquid metal polish. Krytox GPL 206 is a long-lasting, nonreactive, nonflammable grease, safe in chemical and oxygen service. It only contains carbon, oxygen and fluorine, but no hydrogen or silicone. This PFPE/PTFE grease doesn’t degrade in contact with air. It is an ideal grease for vacuum load locks, vacuum door seals, O-rings, moving aperture holders and valves found on electron microscopes and laboratory vacuum equipment. Available in 60 gram tubes. Replacement clear lids for the EM-Tec CGB4 cryo grid box. The EM-Tec ESD safe epoxy coated anti-magnetic electronic tweezers are Swiss made, precision engineered high quality tweezers which offer enhanced operator comfort. They are made from a special, low carbon, high strength stainless steel with the grips coated with an ESD safe black polyester epoxy. The resistivity of the epoxy coating is 10E-5 to 10E-6 Ohm. The black epoxy coating results in an impact resistant surface with good elasticity and improves operator comfort. Good resistance to many diluted acids and alkalis. The Micro-Tec ESD-safe, black wafer carrier trays are specifically designed to ship, transport or store semiconductor wafers. 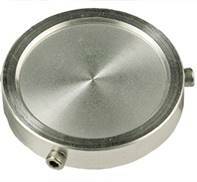 Primarily designed to hold thin silicon wafers, but are equally suitable for glass, quartz, sapphire, GaAs and other thin round wafers in sizes from Ø1” to 6” or Ø25 to 150mm. silicon wafer" width="60" height="50" align="right" />The Micro-Tec <P/100> silicon wafer substrates can be used for sample substrates, micro-fabrication, substrate for thin film research or biological substrates. Useful flat substrate for SEM imaging of particles due to the low background. For biological applications, Si has similar properties as glass and can be used to mount or grow cells. Can be easily cleaved or used as a whole wafer. The Micro-Tec Si wafers are packed in a wafer carrier trays for protection. 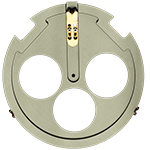 The range of the EM-Tec SEM wafer holders with the unique locking slide has been expanded with wafer holders for 2” (51mm) and 3” (76mm) wafers. Premium quality Micro-Tec optical lens paper tissue for optical instruments cleaning and EM laboratory applications. Carefully made from new stock to achieve a soft and safe tissue free of mineral and vegetable filler. Lint-free, acid-free, soft but strong tissue which can be used either dry or wet. Useful for many applications to protect and clean sensitive surfaces. The Micro-Tec optical lens tissue can be used to replace the Ross lens tissue, which is no longer available. Available in sheets with a size of 100x 150mm (4”x 5”), supplied in booklets with 50 sheets. Sold in packs of 6 booklets with a total of 300 sheets and packs of 30 booklets with a total of 1500 sheets. The selection of Ø54mm high purity sputter targets has been expanded with Tungsten, Tantalum, Niobium and Molybdenum sputter targets. Compatible with Leica, Bal-Tec, Emitech and Safematic sputter coaters. The EM-Tec CD series of light-weight Styrofoam cryo containers have been designed for handling, transport, short time storage and use of small amounts of liquid nitrogen (LN2). The flat base offers good stability and the wide open top allows for easy access. They are useful for many applications involving liquid nitrogen such as cooling, application, plunging and transporting small amounts of LN2. With the available sizes from 0.07 to 4 litres, the correct size can be chosen for the application at hand. Holding time is approximately 6 hours. The EM-Tec CGB-7 cryo grid box is used with cryo vitrification systems. It is a round grid box with 4 diamond shaped positions and a pin type lid. 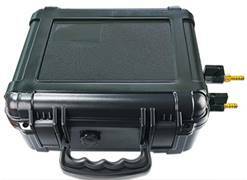 The EM-Tec CGB-7 cryo grid box is compatible with the FEI Vitrobot, Gatan CP3, Gatan 3500, Gatan 626 and Leica EM GP cryo systems. Dimensions of the EM-Tec CGB-7 are Ø14 x 5.2mm, M3 thread. High quality, disposable nitrile laboratory gloves which offer a comfortable fit and high sensitivity feel. They are ideal for avoiding contamination when working with SEM / FIB and or TEM. They also offer protecting against chemicals during sample preparation, cleaning and filling rotary pumps with oil. These ambidextrous blue nitrile disposable examination gloves are latex- and powder-free, which makes them suitable for users with latex-allergies. Available in sizes S, M, L and XL and packed in a box/100. The EM-Tec knitted nylon gloves are intended for clean handling of sensitive parts, optics, and assemblies without leaving fingerprints. Useful for handling parts for SEM, TEM, FIB or high vacuum systems. The knitted nylon fabric is more comfortable than nitrile or latex gloves. Can be used multiple times, low particle shedding. Stretchable fabric, supplied as a one size fits all with an elastic cuff, ambidextrous. Colour is white and sold as one pair. The EM-Tec polyurethane gloves are suitable for longer wearing periods and protect better against contamination. These are finely knitted nylon gloves which are coated with a thin layer of ESD safe polyurethane on the inside (palm and fingers). They also offer puncture and abrasion resistance with a breathable back for comfort. The polyurethane coated nylon gloves are a superior alternative for pseudo-leather gloves. The anti-static polyurethane coating makes these gloves ESD safe. Available in sizes M and L. Colour is white and sold as one pair. The Value-Tec style 669.MS tweezers with the flat, round tips are designed for securely holding small round objects. 155mm long. The EM-Tec high purity carbon tabs are now available with 6mm and 9mm diameter. The EM-Tec CGB-6 premium cryo grid box incorporates a number of improvements like a click-stop rotating lid, a vertical ridge on the lid for easy rotation, marked cavities and a unique number for each individual cryo grid box. The base is a round grid box with 4 diamond shaped positions, marking of each position and an index notch. The lid can be rotated with standard laboratory tweezers and the click-stop mechanism keeps the lid on the base and in place when a cavity is selected. The unique numbering makes it easy to archive the samples, to retrieve from storage and to avoid archiving mistakes or mix-up of samples. The EM-Tec CGB-6 cryo grid box is compatible with the FEI Vitrobot, Gatan CP3, Gatan 3500, Gatan 626 and Leica EM GP cryo systems. The super smooth high purity double sided conductive adhesive carbon tapes are especially developed for imaging and analysis applications of fine powder and fibre samples. The adhesive material used for the tabs and tapes is fully transparent for EDS analysis with only trace amounts of Al and Si. The material is constructed using a super smooth aluminium foil coated on both sides with a conductive, carbon filled pressure sensitive acrylic adhesive. The result is a super smooth surface combined with high conductivity. Total thickness of the material is approximately 110µm with an adhesive thickness of 40µm on each side. The adhesive exhibits a high adhesion strength to metals, plastics, ceramics, wafers, rubber, wood, glass, paper, and small particles or fibers. The EM-Tec super smooth conductive double sided adhesive carbon tabs care supplied on a clear plastic sheet with a white plastic liner tab. Available as Ø12mm and Ø24mm carbon tabs. EM-Tec AG44 is a conductive silver paint based on fine silver flakes (10-1um size) with a low VOC acrylic binder. Achieves excellent bonding properties on a wide variety of materials including, plastics, ceramics, glass, metals, wood, rubber, epoxies and textiles. The tough, low VOC acrylic binder reduces material loss whereas the silver flakes ensure excellent conductivity. Ideal for making grounding tracks and to bond SEM samples on sample stubs. Samples can be easily removed. This silver cement has the consistency of a thin paste. Dries relatively quickly, depending on thickness; reduce drying time with moderate heat up to 65°C. Can be used on flexible surfaces. Solvent is acetone, solution contains 61% silver, acrylic based binder. EM-Tec AG44 exhibits excellent conductivity. EM-Tec AG46 is a conductive silver paint based on fine silver flakes (10-1um size) with a water based urethane binder. It does not contain VOC, is solvent-free and is non-flammable. Achieves excellent bonding properties on a wide variety of materials including, plastics, ceramics, glass, metals, wood, paper and paints. Safe to use on even the most delicate plastics. The water-based urethane binder reduces material loss whereas the silver flakes ensure excellent conductivity. Ideal for making grounding tracks and to bond SEM samples on sample stubs. Samples can be easily removed. EM-Tec AG46 exhibits excellent conductivity. EM-Tec SB10 Stub-Storr white cardboard boxes offer a cost-efficient and compact storage solution for both standard pin stubs and the short Zeiss pin stubs. Made from clean 350g/m2 white cardboard. The insert is secured in the box to prevent it from moving upwards. Storage capacity for 10 Ø12.7mm or 2 of the Ø25.4mm pin stubs of the 25.4mm pin stubs. The Stub-Storr box size is 38x38x90mm (L x D x H); inside clearance is 20mm, which leaves a maximum sample height of 17mm on the pin stubs. Ideal for educational setting, storage of non-critical samples, temporary storage or large volume/low cost storage. The EM-Tec Stub-Storr boxes are supplied flat in packs of 10, 50 and 100. The EM-Tec Save-Storr 4 has been introduced to store large samples, parts or assemblies under inert gas. The storage capacity of this sturdy, thick-walled ABD container is 4 ltr. An additional advantage is that light-sensitive samples are fully shielded from light. The EM-Tec Save-Storr 4 is ideal to store SEM sample holders, vacuum parts, detectors, assemblies, etc under inert gas. Made from thick-walled black ABS, the interior can be custom modified by adding clamping strips to the base of the container. 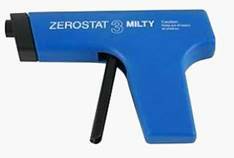 The Zerostat 3 anti-static gun is an effective and professional tool to reduce and remove static charges on insulating surfaces such as plastic, glass, films, porcelain, ceramics, storage boxes etc. It contains a piezo-electric crystal device with a trigger mechanism which generates positive and negative streams of ions. The Zerostat 3 includes a dual cycle operation: when the trigger is squeezed, positive ions are released. When the trigger is released, negative ions are generated. The Zerostat 3 anti-static gun can remove or substantially reduce static charges on non-conductive surfaces. It can be used on plastics, glass, ceramics, films, lenses, grid boxes, storage boxes, microscope slides, etc. The Zerostat 3 can also be used to threat surface to prevent static charging for several hours. The EM-Tec TE1 and TE3 t-EBSD holders are designed to enable EBSD measurements on TEM grids and FIB lift-out grids with lamellas. The pre-tilt holders include 70° and 20° tilt planes to facilitate both planar and cross-section EBSD measurements. The TEM / FIB lift-out grids are held with a copper spring. 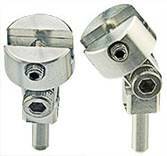 The EM-Tec C-Square multi pin stub holders are primarily designed to hold multiple Ø12.7 mm and Ø25.4mm pin stubs in a square pattern. They offer optimum X-Y coverage of the SEM stage and allow for easy alignment with the engraved lines in X-Y directions. To facilitate quick and easy loading and exchange of the pin stubs, proprietary conductive gripping O-rings hold the pin stubs in place and provide a conductive path at the same time. Available in 6 different sizes from 9 to 49 pin stubs of Ø12.7mm. The FEI Teneo Volumescope pin stub with groove is an improvement on the standard Volumescope stub. It has the exact same external dimensions but with a groove added for easy manipulation and loading. These improved pin stubs are fully compatible with the FEI Teneo VS SEM system: Ø3.1mm pin, Ø8mm head and raised platform for sample mounting. Made from vacuum grade aluminium. The EM-Tec SB2 and SB3 are both heavy duty pin stub storage tubes. 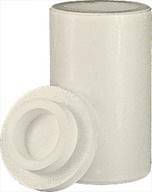 The sturdier polystyrene tube offer better protection for your samples and reduces the chance of breakages in transport. The EM-Tec SB2 is made for the 12.7mm pin stubs, but can also accommodate the EM-Tec 19mm pin stubs. The EM-Tec SB3 has been developed for the larger pins stubs and can accommodate the 25.4mm and 32mm pin stubs. The Micro-Tec diamond scribers are useful for marking, engraving and scribing samples, tools and specimen substrates. They are also ideal for scribing silicon wafers prior to cleaving. The natural diamond tips base sizes are approximately 0.8mm in diameter and vacuum brazed on a tool steel shaft. Available with 60, 90 and 120 degrees tip. Scribers can be used on a wide variety of materials ranging from glass, ceramics, silicon, metals and plastics. The EM-Tec PS44 is a larger version of the EM-Tec PS4 mini pin vise stub and holds 4 samples. The sample is clamped between the two mini vise clamps. The samples are held vertically with 4 small set screws. Most effective way to study cross sections or thin samples. Holder size w/o pin is Ø25.4 x 7.2mm. Standard pin. 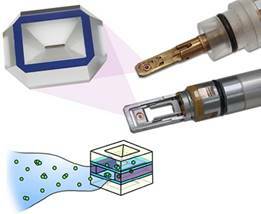 The compact EM-Tec PS44 increases productivity en reduces downtime for pumping/venting of the SEM chamber. EM-Tec F18 is a high capacity FIB grid holding stub for holding up to 8 FIB grids with 4 individual small clamps. The popular and cost-effective EM-Tec V22 compact vise sample holder (with pin or M4 thread) has been improved by replacing a the flat head screw and allen key by a knurled brass knob, which enables quicker and easier opening and closing. The new EM-Tec MV22 combines the popular compact vise with a multi pin stub holder (with pin or M4 thread) for up to 5 standard 12.7 mm diameter pin stubs. Compatible with standard pin stubs and the shorter Zeiss pin stubs. The EM-Tec MV22 has been designed for use in SEMs with smaller stages and for table top SEMs such as the Hitachi TM3030/3000/1000 series and the JEOL NeoScope. EM-Tec 3V22 triple compact vise holder(with pin or M4 thread) includes three separately adjustable EM-Tec V22 compact vises on a single base plate. Enables holding and investigating three different samples to save on SEM venting and pumping time. Made from vacuum grade aluminium, brass spindles and stainless steel screws. Ideal for high throughput investigations of smaller samples and cross sections. Reduces downtime for venting/pumping of the SEM chamber. Designed for stages with 75x25mm or more X-Y travel distances. Perfectly manufactures Eyelash manipulators for carefully manipulating ultra-thin sections, tissue samples and small samples or parts under a microscope. Lightweight, cost-effective and consistant quality compared to natural hair eyelashes. The set contains three Eyelash manipulators with an Eyelash length of 13, 18 and 21mm. This large EM-Tec EM-Storr vacuum storage container has been made to the same design specifications as the standard size EM-Storr vacuum container. The EM-Storr 110L includes a larger chamber with a size of Ø110x25mm and a larger glass with 130mm diameter. It is large enough to store 4”wafers under vacuum. The selection of EM-Tec sputter targets has been expanded with Ø24mm disc targets used on the cryo-SEM preparation systems made by Quorum / Polaron / Bio-Rad / Fisons / VG-Microtech/ Thermo. Available sputter target materials are: Gold, Gold/Palladium, Platinum, Chromium and Iridium. The dual storage shelves for the EM-Tec Save-Storr sample storage container virtually triple the storage area. Made from perforated aluminium with 25mm high feet. 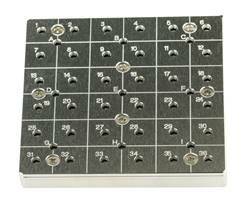 The perforated sheet contains 57 holes for SEM pin stubs. The complete selection of these vise type sample holders now offers a choice of 1, 4, 12, 16, 20, 26, 38, 52, 80 and 120mm wide sample holders. Pikal metal polishing paste is a superior polishing paste with excellent cleaning and polishing properties. It is a tried and tested products with an excellent track record going back more than 100 years. Pikal does not contain silicone and is there for ideally suited for high vacuum systems and cleaning parts of electron microscopes. 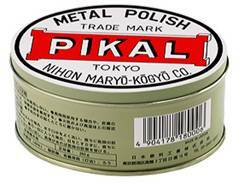 Pikal metal polish is formulated as a thick paste which can be diluted with a kerosene/water mixture. Sold in the iconic 250 gram tin. Practical and easy to use laboratory engraving tools help with marking and identifying samples, tools, sample holders, etc. Choice of the powerful DM11 electric engraver or the pin style battery operated SL20 Micro engraving pen. The SDM11 is the intended for lab use, where as the SL20 is ideal for field use or for difficult to reach spots. Krytox GPL 207 is a long-lasting, nonreactive, nonflammable grease, safe in chemical and oxygen service. It only contains carbon, oxygen and fluorine, but no hydrogen or silicone. This PFPE/PTFE grease doesn’t degrade in contact with air. It is an ideal grease for vacuum load locks, vacuum door seals, O-rings, moving aperture holders and valves found on electron microscopes and laboratory vacuum equipment. Available in 15 gram and 60 gram tubes. The EM-Tec Quartz crystals are particularly suited for thickness monitors, thickness controllers and quartz crystal micro-balances (QCM) used on SEM sputter coaters and vacuum deposition systems. Size is 14mm diameter and fully compatible with the 6 Mhz sensors. Available with gold and silver contacts in flat pack carousels with 10 crystals. The EM-Tec sample pin for cryo ultramicrotomes includes a 3.5mm head with concentic grooves and a 2mm diameter pin. The EM-Tec cryo pin is 10mm long, made from cryo compatible aluminium. Micro-Tec plastic membrane boxes range extended The selection of Micro-Tec plastic membranes boxes has been extended with two practical sizes. The Micro-Tec M42 with a box size of 100x60x22mm and the Micro-Tec M43 with a box size of 210x75x27mm. Both are clear membrane boxes with hinges and a clasp.. Ideal for storing and shipping samples or small parts. The samples are held between the two semi-porous membranes. Additional brackets and thumb screws are optionally available. The EM-Tec Save-Storr sample storage container has been developed to store sensitive samples under a dry and inert gas atmosphere. It consists of a robust clear polycarbonate container with seal, gas inlet valve, gas outlet valve and an over-pressure safety valve. The EM-Tec Save-Store container offers ample storage facility with a 1.75 ltr contents and an optional storage shelf. This extra large multi-stub preparation or storage stand accommodates 57 standard 12.7mm pin stubs or 18 of the larger 25.4mm pin stubs. Ideal for preparation, handling and storing many pin stubs. The EM-Tec filter disc holders have been designed hold standard disc filters for particle analysis and EDX investigations. They are held flat by a clamping ring on a base plate. Available for 13, 25, 35 and 47mm diameter disc filters. For multiple disc analysis, the EM-Tec XL-100 multi-disc filter holder can be used. HOPG – Higly Ordered Pyrolytic Graphite for AFM / SPM applications in three grades: ZYA, ZYB and ZYH. Can be used as substrate or as magnification calibration standard. High quality, razor sharp coring tools with plunger system to eject or transfer the sample. Available in sizes from 1 to 4mm diameter. Ideal for cutting smaller samples from soft and thin materials such as paper, tissue, cloth, plastic films and coatings. This sample holder and stub adapter kit has been devised to hold a variety of SEM samples up to around 40mm. 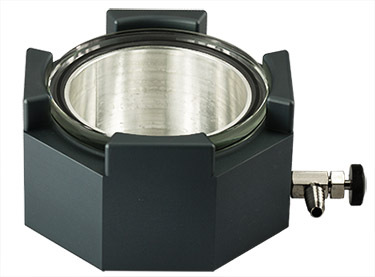 It also contains a selection of SEM stub adapters to use the sample holders on all major SEM brands and to interchange different SEM stubs between different SEM brands. This universal kit is presented in a high quality wooden box with a plastic insert. Efficient, easy to use and safe alternative for Uranyl Acetate. Uranyless delivers similar results in with short staining times compared to Uranyl Acetate, but without the restrictions, toxicity and waste elemination problems. Uranyless is the result of many years of research and is made of proprietary mix of multiple lanthanides with high affinity to biological tissue. Comes as a ready to use solution in an Airless bottle. Exceptional value ceramic tip tweezers with high temperature ceramic tips on stainless steel handles. High wear resistance, high corrosion resistance and high temperature resistance up to 1400 degrees C. Available in six different styles with fine, strong and curved tips. Great value 160mm long fine tip sorting tweezers for sorting, picking, and handling small parts, seeds, gems etc. Choice of 6 different models in stainless steel, titanium, locking and strong points. Also available with ESD safe black epoxy coating to provide better contrast against white or transparent parts. EM-Tec standard vacuum components for replacement and maintenance on laboratory vacuum systems with KF / NW / QF vacuum flanges. Centering rings, replacement O-rings, blanking caps, clamps and 1/8” NPT & 1/4” NPT adapters for vacuum measurement gauges. The EM-Storr vacuum sample containers have been deveoped to safely store SEM/TEM/FIB samples and calibration standard under vacuum. The superior EM-Storr vacuum container has been designed using high vacuum compatible materials and high vacuum design rules. The versatile EM-Storr vacuum desiccator is available in 5 configurations. Aluminium body with hard anaodized outside. Clear hardened glass lid and space saving stackable design. 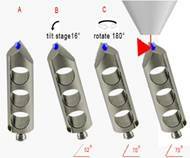 New and unique pin stub based EM-Tec swivel tilt sample holders, which enable clamping small and thin samples, have been added to the existing selection. The EM-Tec swivel tilt holders allow for quick and easy tilting in both directions. The full range of the EM-Tec swivel tilt holders are also available for Hitachi SEMs with M4 thread and JEOL SEMs with a 12.2mm stub holder. Using the EM-Tec PH90 90 degree off-set holder, several Quick-Flip holders have been created. These enable quick and easy rotation of 90 degrees; samples can be imaged both in top view and cross section view. Additionally, the sample can be rotated a full 360 degrees. Ideal for desk-top systems and SEM which don’t offer 90 degrees SEM stage tilt. - EM-Tec FS21 with two standard 12.7mm pin stubs and EM-Tec F12 FIB grid holder stub; available with pin and M4 thread. - EM-Tec FS22 with two standard 12.7mm pin stubs and two EM-Tec F12 FIB grid holder stubs for multiple lift out on a single sample. Available with pin and M4 thread. Both sample stubs and FIB grid holder stubs can be rotated for optimum orientation during lift-out procedures. In repsonse to customer request we have added a 4 post EM-Tec copper FIB lift -out grid. The selection of EM-Tec copper FIB lift-out grids now includde 2, 3, 4 and 5 posts FIB lift-out grids. 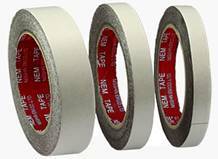 #15-000508, #15-000512 and #15-000520 for the 8mm, 12mm and 20mm wide double sided carbon tapes. The EM-Tec scissors are made from select grade stainless steel and designed for lab, microscopy and dissection applications. Selection of different sizes and tip shapes: blunt, blunt/sharp and sharp. Sharp tips are offered straight and curved. For fine work and disscetion two style of vannas micro scissors are available on this page. 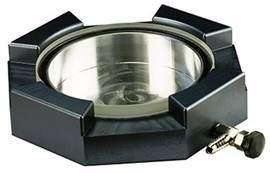 The EM-Tec wafer holders are specially designed to hold semi-conductor wafer in sizes of 100mm, 150mm and 200mm diameter (4 inch, 6 inch and 8 inch). They are compatible with wafers with either a flat or with a notch. The unique locking slide is adjustable to cope with non-standard wafers. Low profile and balanced light-weigth design with cut-outs for wafer tweezers, adjustable slider and adjustable spring tension. EM-Tec GS10 – A swivel vise which covers a full 180 angle and can also be rotated with the stub. EM-Tec GB16 – Rectangular type bulk sample holder with two side brackets for sample thickness up to 16mm. 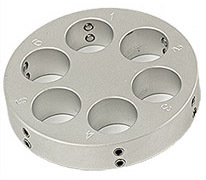 EM-Tec GR20 – Round type bulk sample holder with three brackets for round and awkwardly shaped samples up to Ø20mm. EM-Tec GS25 – Lightweight, spider like holder for awkwardly shaped samples up to Ø25mm. EM-Tec GS45 – Lightweight, spider like holder for awkwardly shaped samples up to Ø45mm. EM-Tec GZM4 Zeiss pin stub adapter and EM-Tec GSPM4 standard pin stub adapter. 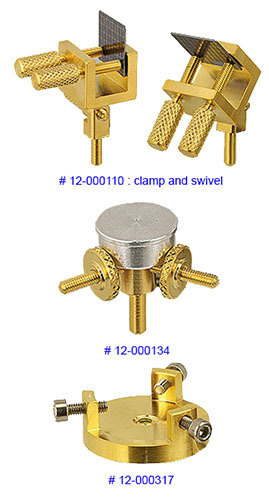 The EM-Tec gold series sample holders are all available with pin stub and some with an M4 threaded hole. holder up to 120 mm with extra clamp plates (#12-000204). for up to 80mm, M4, clamps in off set position. The EM-Tec versatile vise clamp holders are large vise clamp sample holders with positionable vise clamp plates. These sample holders can accomodate large and heavy samples or even multiple samples. They are designed for SEMs with large sample stages which can cope with larger and or heavier samples. 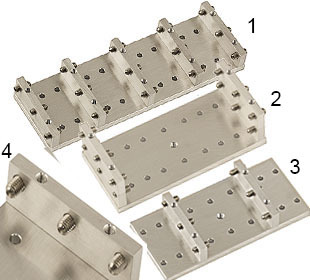 Additional vise clamp plates can be added to mount multiple samples in the same vise clamp holder. A common problem with Mo FIB lift-out grids is the roughness of the side wall. It takes valuable FIB time to smooth out the sidewall of the standard molybdenum FIB lift-out grids to enable secure mounting of the TEM lamellas. To solve this common problem and to reduce cost at the FIB, we have developed smooth side wall Mo EM-Tec FIB lift-out grids. They are made with a unique manufacturing process with the result that smoothing with the FIB is virtually eleminated or reduced to a faction of the time previously needed. 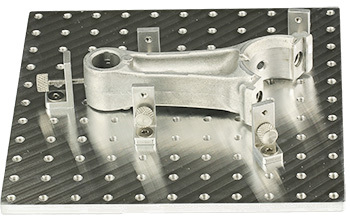 These unique Mo EM-Tec FIB lift-out grids have three posts and a thickness of 45-55µm. Packaging size is vial/25.